I have many food memories of growing up, but somehow pie is closely connected with my grandparents. Chocolate cream pie will always remind me of my grandpa. My parents often sent me off to visit family during the summer and several summers, I went to stay with my grandpa who lived in New Mexico and Arizona while I was growing up. We would take road trips, camping out along the way. I have vivid memories of a long trip where we ended up sleeping under the stars by the side of the road, my grandpa too tired to drive until we found a campground. Not a single car passed us and the desert landscape was silver by the light of the moon. But the pie was my favorite. My grandpa liked to stop at roadside diners along the way and before we settled in for lunch or dinner, we made sure they had at least one slice of chocolate cream pie under their pie case or in the fridge. I only realize now how special that was, my granpa’s way of showing me he loved me. Lemon meringue pie belongs to my grandmother, because she’s the one who showed me that it was an edible species of pie. I had been loyal to my chocolate cream pie for years, branching out to several kinds of fruit pies, but I’d never found a lemon pie I deemed worthy of the calories. However, one summer night when I was visiting my grandma, she made me a believer. 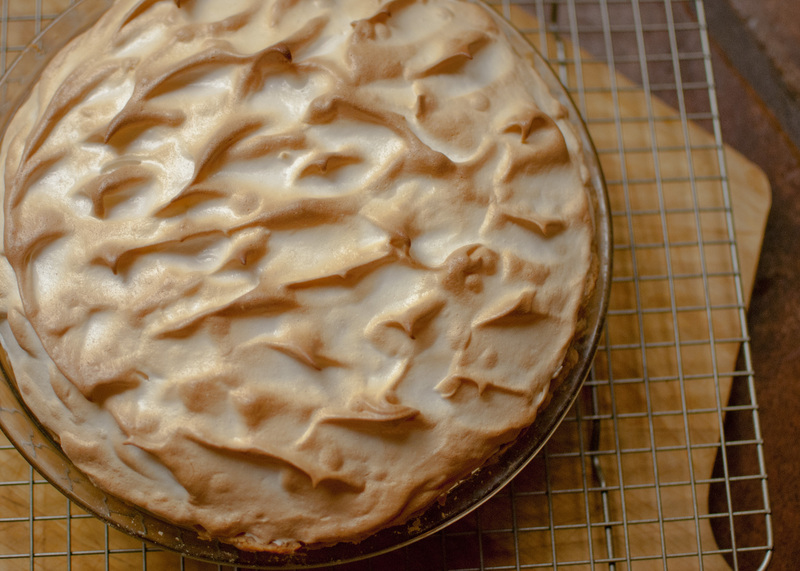 We were chatting about pies in her Montana kitchen and somehow lemon meringue came up. She asked if I’d ever had a home baked one and I had to admit that I had not. She happened to have all the ingredients on hand except lemons, which I walked to the store to get and then she transformed them into the most luscious lemony cloud I’d ever eaten. I haven’t quite matched her recipe yet, I mean who can match your own grandmother’s recipes? But the following recipe is a combination of a few I found and we were all pretty happy with it here. Even if it didn’t come out of my grandma’s kitchen, she was with me in spirit. 2. Prepare the Butter Crust dough by rolling it out on a lightly floured surface or between 2 lightly floured pieces of wax or parchment paper. Roll to a thickness of 1/8 inch. Ease gently into a 9-inch pie pan. Trim the overhang if necessary then flute and decorate edge as desired. Place in freezer for 10-15 minutes, this helps set the dough so it won’t collapse when you bake it, then prick the crust all over with a fork. Bake for 20-25 minutes until crust is golden. Set aside to cool and reduce oven temperature to 325 degrees. 3. Make filling: mix sugar, cornstarch, salt and water in a large, nonreactive saucepan. Bring mixture to a simmer over medium heat, whisking occasionally at the beginning and more frequently as mixture begins to thicken. When mixture starts to simmer and turn translucent, or if it’s not simmering, but is coating the back of a spoon, whisk in egg yolks, 2 at a time. Whisk in zest, then lemon juice, and finally the butter. Bring mixture to a good simmer, whisking constantly. (Mine never came to a really solid simmer, but was thick and coating the back of a spoon after about 8-10 minutes, so I called it done.) Remove from heat and cover to maintain heat while you make the meringue-either with a tight fitting lid, or with plastic wrap right on the surface. 1. Mix sugar and cream of tartar together. 2. Put egg whites in a medium size bowl and beat until stiff but not dry. Continue beating and add sugar/cream of tartar mix 1 tablespoon at a time. Beat until mixture is thick, glossy and stands in stiff peaks. 3. Add the lemon juice and beat well. 1. Pour lemon filling into baked crust. Spread the meringue over the filling, putting big dollops around the edge and then spreading until the meringue covers the filling completely and seals the edges. Use back of spoon or tip of spatula to make decorative peaks all over the meringue. Bake in 325 oven for 20 minutes or until meringue is golden. Transfer to a wire rack and let cool to room temperature. Serve that day or refrigerate until filling is set. This is my go to pie crust recipe. The trick to pie dough is not to handle it too much and keep all the ingredients as cold as possible. 1. Sift the flour and salt together in a large bowl. Cut in shortening and butter using a pastry blender or 2 forks. Blend together until the mixture has the texture of coarse crumbs. 2. Sprinkle the water evenly over the mixture. This is the part where you need to be careful not to overmix! Blend gently until all the ingredients are moistened and the dough can be shaped. Divide the dough into two equal portions and shape them into balls. It will be a bit easier to handle if you can chill this dough for about an hour before rolling out. 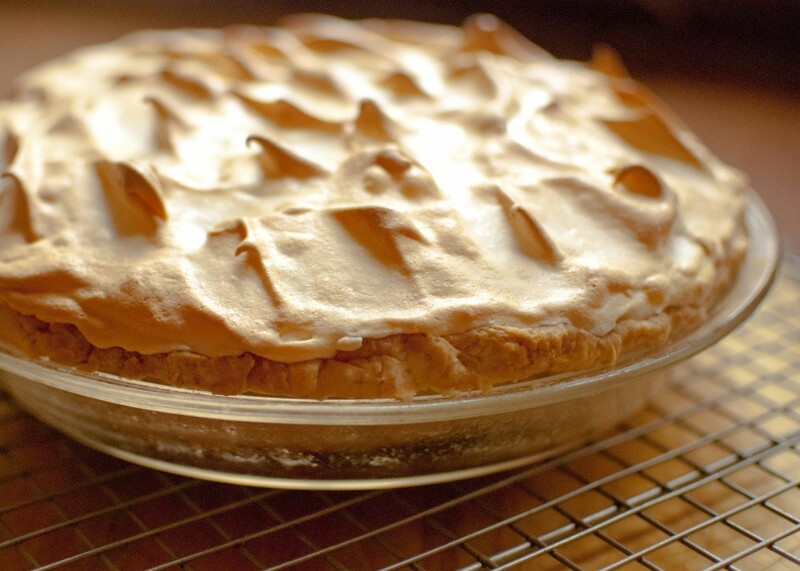 This entry was posted in desserts, Posts and tagged crust, lemons, meringue, pie.